On our second morning on Cape Breton, we awoke at the cozy Albert’s Motel in Chéticamp and planned the day over coffee on the porch. Our next accommodations were reserved at the Broad Cove campground near Ingonish on the eastern side of the park. 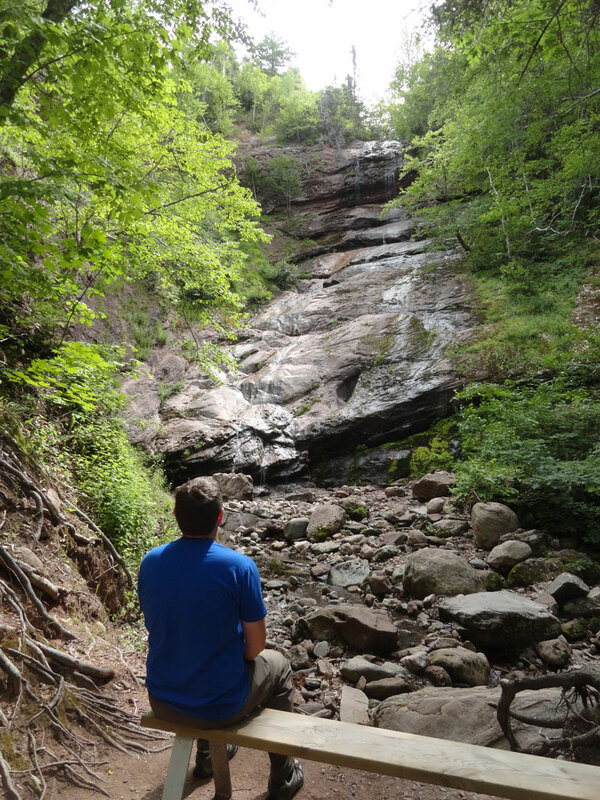 In between, there was much more of Cape Breton Highlands to explore. On our way out of town, we stopped by the docks to look at the picturesque fishing boats. Across a narrow channel on Chéticamp Island, we noticed a herd of cows taking a morning stroll on the beach. Some waded in the water as others milled around an Acadian flag flying from a branch planted in the sand. It looked like their own happy little cow nation. Chéticamp is a pleasant place to live for both man and beast apparently. We drove the Cabot Trail up and over the high plateau of French Mountain. Beyond our previously-visited Skyline and Bog trails, the road traces a narrow ridge called Boar’s Back and then shimmies down to the ocean in a series of switchbacks. A little farther ahead in Grande Anse Valley, we hopped out of the car to see Lone Shieling, a replica Scottish crofter’s hut. A man who left the surrounding 100 acres to the park in 1934 requested that it be built to honor the local Scottish heritage. 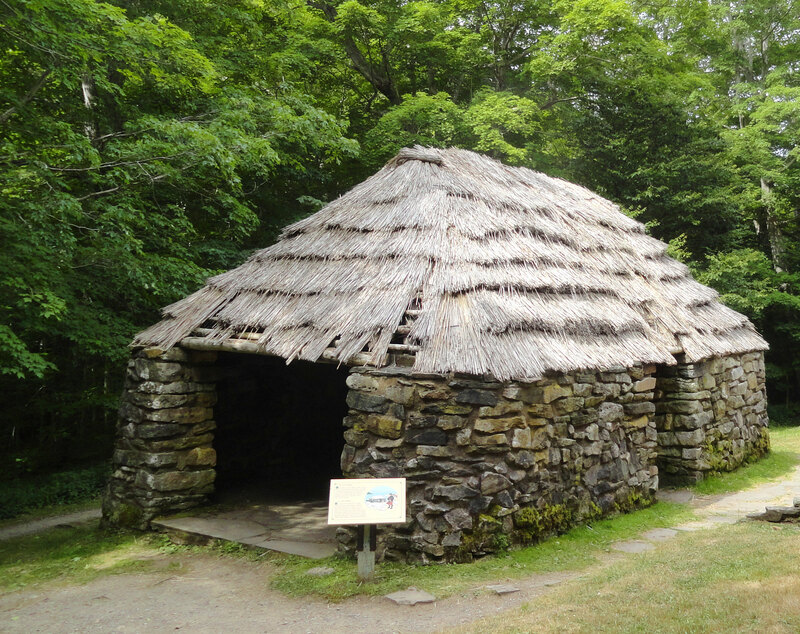 This type of stone-walled, thatch-roofed structure is where a tenant farmer would take shelter while tending a herd of sheep on grazing grounds away from his village. A short trail loops through the surrounding old-growth forest. The towering maple trees here are up to 350 years old, as a result this area is one of the most protected parts of the park. We decided to take a 2.2 km, unpaved side road to see Beulach Ban Falls (Gaelic for “white gorge”). This 20 meter waterfall occurs where water spills from the highlands down into the Aspy Valley, a strike-slip fault that makes a diagonal gash across the park. The parking area at the end of the road is the trailhead for the 9.6 km Aspy Trail, but the falls themselves are just a short walk away. Recent weather had been dry, so Beulach Ban wasn’t the rushing torrent seen in photos, it was just a trickle dripping down the rocks, but it was still pretty. Approaching the northernmost point of the Cabot Trail, it briefly leaves the park and passes through the settlement of Cape North. 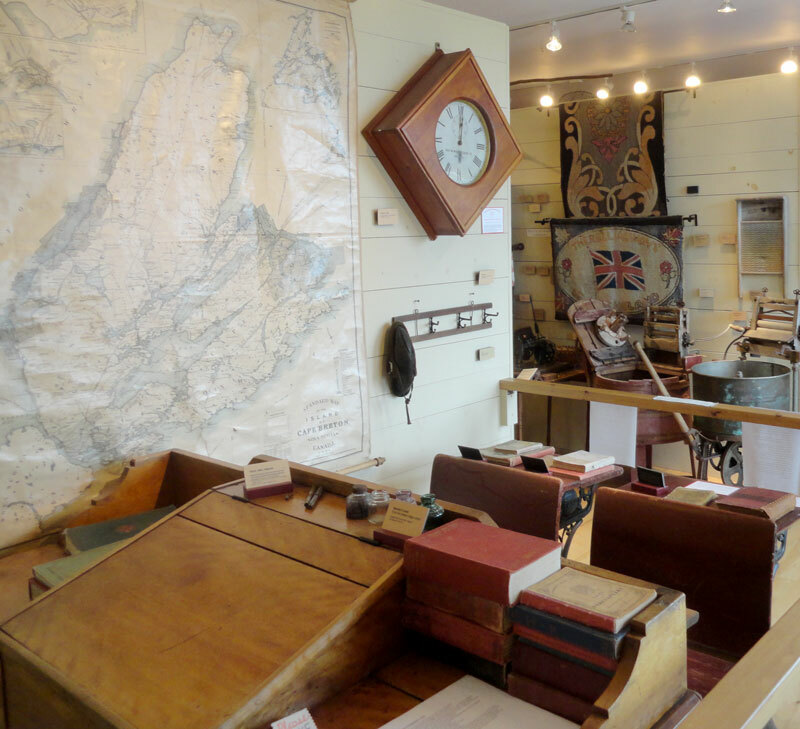 Here the hyper-local North Highlands Community Museum celebrates the history and culture of Cape Breton Island’s northernmost peninsula. Well-designed interpretive exhibits display the early life of settlers on the island. Re-created interiors show what home life was like, while other displays focus on education, commerce and industry. As always in Nova Scotia, the ocean plays a major role, with fascinating stories of fishing, sea transportation and shipwrecks. Some claim that Aspy Bay is where John Cabot, a Venetian explorer and namesake of the Cabot Trail, first set foot on North America in 1497 (most historians now think he was actually in Newfoundland). Today this area seems remote, but there was a time when it was a center of global communication. Between 1859 and 1866 an underwater cable across Cabot Strait at Aspy Bay created a direct telegraph link from New York City to Cape Race, Newfoundland. This sped up the transatlantic passage of news by several days because ships bearing information could drop a message overboard at Newfoundland and have it telegraphed directly to New York. With electrical pulses passing through Cape Breton on a wire, it then “only” took around six days for news to travel between the continents. This link is how news from the American Civil War was relayed to Europe. All morning, billboards hawking plaid products had beckoned us forward, so at South Harbor we pulled into the little shop called Tartans and Treasures. Clearly we were back in Scottish country. Upon entering, the owner asked if either of us had any Scottish or Irish ancestry. When I answered yes, she pulled out her little reference book and pointed out the family name origin, clan and what tartan applies. My mom’s side of the family falls under the MacBeth clan, so the owner pulled out a fabric sample. Anyone who knows me is aware I love a good plaid, and since I was in need of a Cape Breton souvenir anyway, I had her wrap up a nice Scottish wool scarf for me. Not sure I can pull off a kilt just yet. Just beyond Tartans and Treasures the Cabot Trail was barricaded closed for construction, so we were detoured onto White Point Road instead. 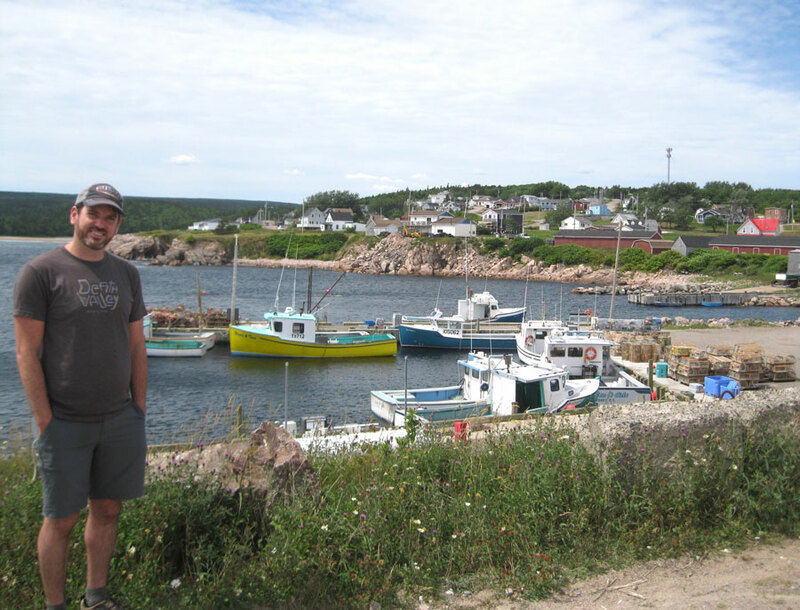 It twists right along a rugged shoreline and then cuts across a peninsula to the seaside fishing village of Neil’s Harbour. Months earlier, when I saw a town that shares my name on a map, I knew we’d have to stop there for lunch because you don’t run into a lot of places called Neil. I feel like I should get a discount there or something. I’m happy to report the town is pretty and unpretentious, so it receives this Neil’s seal of approval. We walked to a narrow peninsula jutting into the ocean that is home to a lighthouse ice cream shop and the Chowder House restaurant. Both the indoor tables and the outdoor picnic area were hopping at the Chowder House, so clearly it was the place to be in Neil’s Harbour. We’d already eaten our weight in seafood on this trip, so what’s one more lobster sandwich? View from the summit of Franey Mountain, overlooking Ingonish and the Atlantic Ocean. Departing Neil’s Harbour, we intended to go to the Mica Hill Trail, but the road was closed from the other direction as well. Instead, we continued southbound to our other preferred option, Franey Mountain Trail. 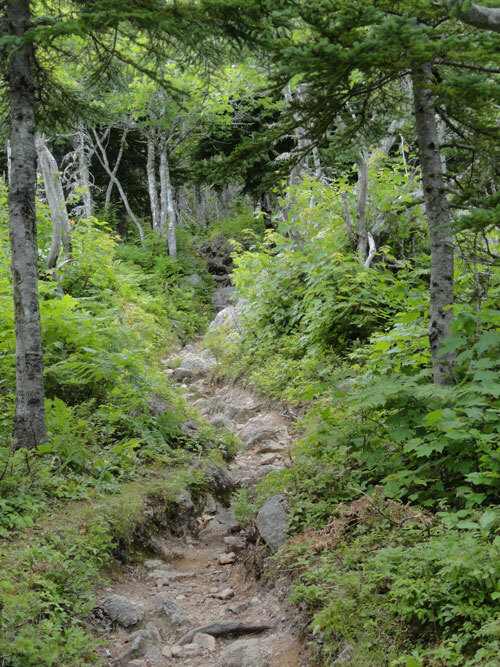 This 7.5 kilometer trail with its 335 meter elevation gain is known as one of the more difficult hikes at Cape Breton Highlands. The trailhead is accessed via the short, steep and gravel Franey Road at the town of Ingonish Centre. The route is a loop with the two ends departing different sides of the parking area. We weren’t sure which one to choose, so we randomly started down the left path into dense forest. The first couple kilometers are typical immaculately maintained Parks Canada crushed gravel. It’s a constant incline, but not overly strenuous. Moving along, the trail gradually becomes more rugged, passing through hardwood Acadian forest. About a kilometer in, a viewpoint gives the first clear panorama into the beautiful Clyburn Brook canyon. As far as the eye can see, a green carpet of uninterrupted trees blankets the land. Above this point some of the trail is rough, rocky and barely wider than a single footpath. Toward the top it crosses a pretty fern-filled bog and even climbs a few stairs. We emerged from the vegetation onto the broad, flat summit to find a panorama of the shoreline and the open Atlantic Ocean. On a rock outcropping we found the red Parks Canada chair and took a seat to admire the view. A small side trail leads down to another rock ledge that overlooks Clyburn Brook from a higher angle. We spent some time resting at the summit enjoying the day before turning around to hike back down. At this point, we could have returned via the same route we’d taken up, but we chose the other side to complete the whole loop. It looked a little longer on the map, but we were surprised to find that it was entirely a wide service path passable by an ATV (so that’s how they got that chair up there). It was smoother and descended in a more gradual fashion, but was also less interesting as a result. We were happy we chose the left path at the beginning, but it’s surprising the difference in the routes didn’t seem to be indicated at the trailhead or in the park brochure. We’d say Franey Mountain makes a perfect hike to take up most of an afternoon. It was secluded during our visit as well, with only about 7 people crossing our path. Overlooking Clyburn Brook from the top of the Franey Mountain Trail. 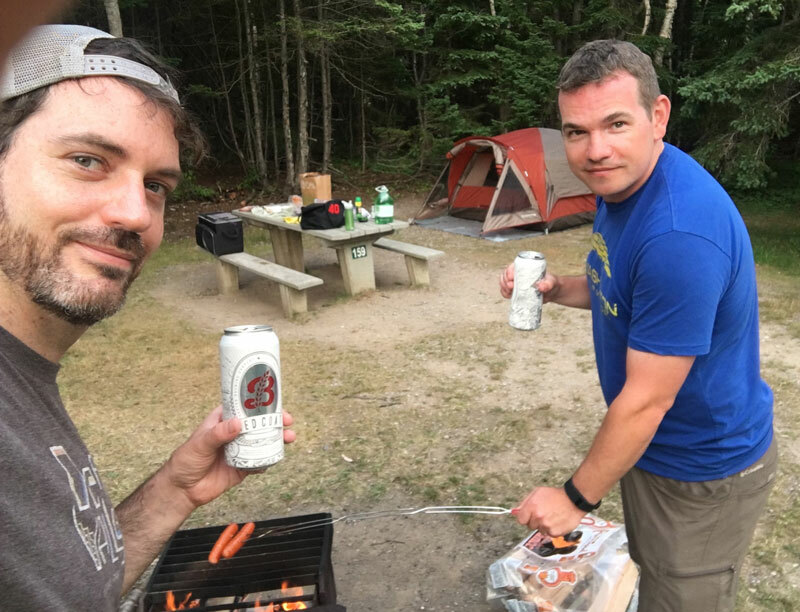 After returning to the car we stopped by the local NSLC (Nova Scotia Liquor Corporation) store and Ingonish Freshmart to stock up the food and beverage department for our evening of camping. The night’s menu would consist of cheese-filled brats, pasta salad and potato salad with cookies for dessert and Breton Brewing beer selections. The Broad Cove campground was a slight backtrack along the Cabot Trail. We checked in and purchased firewood at the entrance station and then proceeded to spacious Site 159 to set up camp. Soon the fire was raging and the beer was flowing. 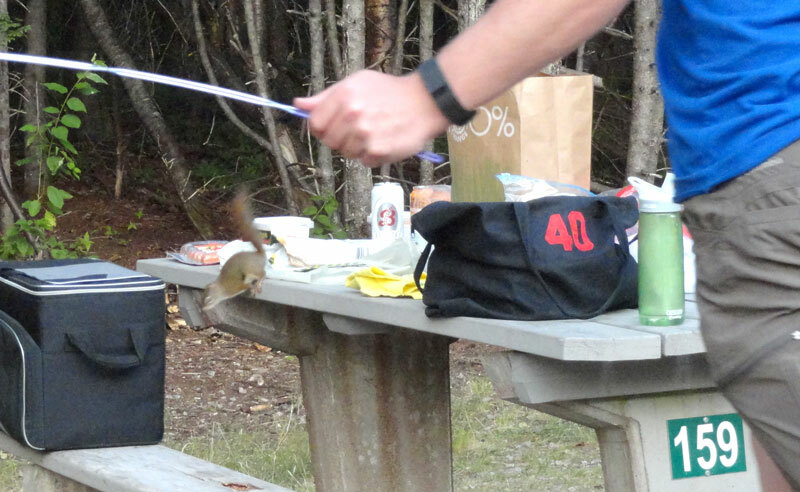 We sat near the fire box to roast the brats, but with the picnic table about 5 meters away, a vigilant local squirrel saw an opportunity and made a run at the potato salad. Luckily Nick’s quick reflexes chased him off. Crisis was averted, but we knew we couldn’t leave the table unattended with the squirrel chattering at us from the trees. After dinner a young parks employee stopped by to let us know there would be a sunset beach gathering beginning shortly. Upon arrival we found people sitting on the sand and our ranger friend playing a guitar and singing folksy songs in a circle. The catchy hit “Bring Back the Boreal Forest” still pops into my head from time to time. Other than some early morning crow wake-up calls, we slept well at Broad Cove. After a breakfast of coffee, dehydrated eggs and cinnamon rolls, we made use of the campground’s wash facilities. Our favorite feature was the communal outdoor sinks for cleaning dishes and camp accoutrements, a great idea that should appear at campgrounds more often. Sunset beach gathering at Broad Cove Campground. Back on the road, we exited Cape Breton Highlands National Park for the final time. The rest of the Cabot Trail twists south-southwestward along the shore. The Gaelic College provided a good stopping point to browse more Scottish souvenirs. After crossing the giant Seal Island Bridge we entered more inhabited territory than we’d seen in a few days. Before long, we were on a four lane freeway that links the towns of Cape Breton Island’s major metropolitan area. It was approaching lunch time, so we headed to the downtown Sydney waterfront and found some good food at the Old Triangle Alehouse. We also paid a visit to the world’s largest fiddle that stands outside the visitor info center. We didn’t sit still too long though, because we were eagerly anticipating our next destination. Fortress of Louisbourg National Historic Site was waiting for us just a half hour down the road, and it would prove to be one of the most unique nights we’ve spent anywhere. This entry was posted in Destinations, Travelogues. Bookmark the permalink.